Here’s an easy Super Bowl Snack you can make right now, from things you already have in your kitchen. In a 1 gallon zip lock bag, combine oil and rub, mix well. Turn and tumble gently again and let sit overnight (on your counter). Enjoy as is, or with a smear of soft cream cheese. Got a bigger crowd? Just double the recipe. We got this recipe from Willie’s Hog Dust. This is the first post I’ve created completely on my Chromebook. Google Drive and PicMonkey work well together! Sounds delicious!! Thanks for posting! I took these into work, and all the guys loved them. They were even better when we figured out smooth, spreadable cream cheese went well on them. Look for a formal review of Willie’s Hog Dust on pork in the near future. 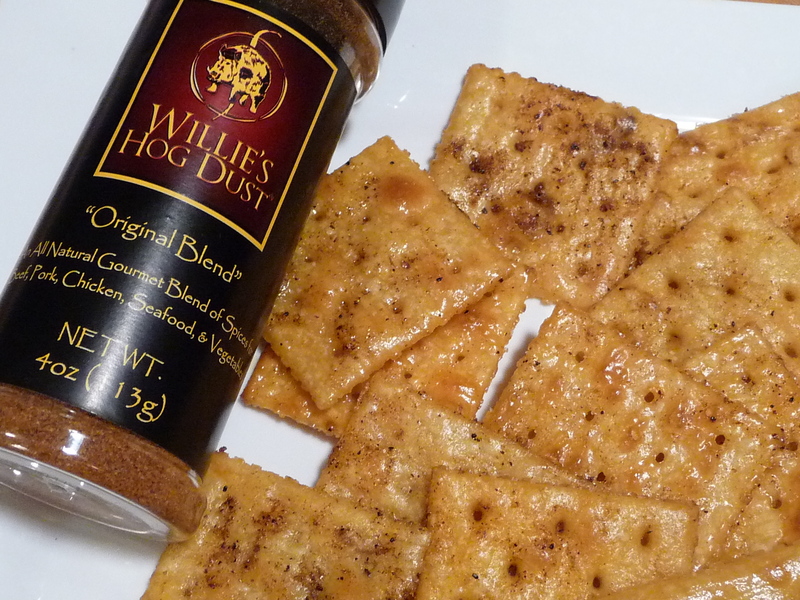 Willie’s Hog Dust was one of the very first reviews I did. It’s still, to this day, one of my favorites. We’ve made several varieties of these at work for snacks, great stuff!